EXTRACTS FROM MONSIGNOR NICHOLAS VIDALIS' BOOK “A CALL FROM THE LORD -which is different for each one” Published by: J & J Hellas Publications, Athens 2008. “Η ΠΑΙΔΙΚΟΤΗΤΑ" (which loosely translated means “childishness”, or in other words, spiritually childlike), which is a collection of biographies of various Saints (Edited and published by Graphion Kalou Typou, Athens 2007). In the book he writes an extensive biography of Saint Gemma, thereby revealing his fondness and devotion for the Saint. 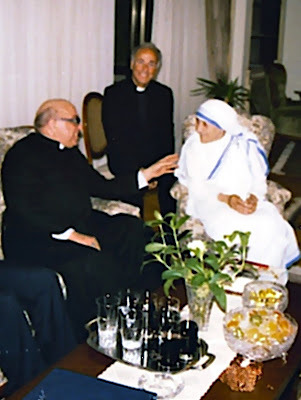 Also, when he decided to publish the monthly christian magazine "Angelos" (translated means Angel), he dedicated the first issue to the Holy Rosary, the second to the Immaculate Conception of the Blessed Virgin Mary, and the third issue to St Gemma. I joyfully present the extracts of his book below because of the wonderful impression it has left upon me, and I thank God that Monsignor Nicholas agreed to publish it. May God be thanked and praised for all the wonderful graces that He wrought in the life of Father Nicholas! And, while there are spiritual lessons to be learned in almost every grace that he was given, such as respect and devotion for the Eucharist, the great honor of the Priesthood, God's love for each person, the importance of Holy Mass, Eucharistic adoration and devotion to our Blessed Mother Mary, however, most of all it is God's love and goodness that shines through in every grace that He has given to Msgr. Nicholas. May He be blessed for His everlasting love, kindness and mercy! My childhood was spent in great poverty. My mother cleaned houses in order to make a living and to give me the opportunity to study at school. I was the only one among my brothers and sisters who graduated from the Marist Brothers High School. I was the only one who finished school! I will never forget that! During the day I was all alone, as my mother was cleaning houses, and I think that she did not eat her food in order to bring it to me ... I was often waiting for her on the street, because she used to come home in the same way she went, on foot, so as not to spend the little they paid her. And the distances were in fact very large! "Do you see? Because we went to Mass, the Good Lord sent this to us so that we can eat today!" And since she had nothing to give me, I remember that she averted her face, so that I could not see her tears. It is very difficult for me to go on ... I wish and pray to God from the bottom of my heart, that she may enjoy great happiness in Heaven. Every Sunday, when we used to go to Mass, my mother used to suggest that I had to confess in order to receive Holy Communion. It was in 1945. This I can tell considering where my home was then. It was Sunday, in St Therese church (1). The confessional was at the back of the Church. I confessed “as usual”. Afterwards I returned to my place, in the middle of the church, on the right. My mother was sitting at the opposite side. I had confessed before Mass started. As I was walking towards my seat, something happened to me. Some kind of confusion, of loss of memory occurred. The Holy Mass proceeded as usual, the homily, the hymns, the Holy Communion. It was the fact that not only I did not pay attention -but of course I did not receive Holy Communion- I did not even realize when Mass finished! People left, the church was empty, and I was standing still there! Motionless! I did not answer, I was still shocked… I pondered over what I had heard and what I had to do… My mother, being very distinctive, did not ask anything else. Surely, the Holy Mass must have lasted at least one hour. During that moment I was talking with The Lord! I cannot tell whether it was internal or external, but I can tell that I was feeling Him close to my ear. It was a catechism in depth and an examination of conscience, from my First Communion (that was not done properly), until my latest Confession. The Lord mentioned all the sins that I had omitted to confess. Of course, He was not stern. I did object in many cases, but He explained everything, so that there was no doubt left in me. “Now, you know. That is why you are going to confess”. “Each time, you are going to confess what you remember. You are going to Confession as many times as needed”. “Go elsewhere; To the Cathedral”. And so I did ; I obeyed. Since then, everything changed for me. I understood things better. I was enlightened. The difference between my old self (before the dialogue with Jesus) and my new self was very obvious to me. I understood that The Lord does not deny His Mercy even to the most sinful and embraces all souls with love and affection. So, I knew then the difference between sin and not sin, although confessors had a different opinion, even nowadays. (1) The author talks about the old St Therese de Lisieux church in 32, Eptanisou str. and not the new one which was erected later. During that period of time I stopped going to the cinema, due to the bad influence of various films (here, I must say that I have never watched “bad” films). Afterwards, gradually, I started not going out with my friends and sharing their opinions. Once, they invited me to go with them to find “something pleasant” meaning sexual. I carried in my pocket the rosary and I was praying silently, not to find that kind of pleasure! And so it happened! I understood that they had talked about me, because she liked me. I cannot deny that I too, felt something for her. It was the onset of a mutual attraction that could have evolved to something more. I turned my head abruptly on the right (from where I had heard the Lord’s Voice) but I did not see anyone. I pushed the girl away and sat on the couch ignoring all the others. And that was the end of all that stuff. From then on, I stopped going to my friends’ parties. However, I did not confide to anyone what was happening to me. I even did not mention it when I was confessing. I did not do that, because I wanted to hide something, but I simply thought that it was the right thing to do. I left behind me the Municipal Market of Kypseli and while I was walking towards Aghia Zoni I crossed perpendicularly Fokionos Negri str. In the middle of the street there was a garden. On both the left and right side streams were running. There were tree-shaded pavements, roads on both sides, then pavements again and then the houses. There was even a pond where I used to swim in the summer. The eucalyptuses were really very high! I cannot recall anything else… Of course, more things where said before and after. I am still marveling at the subtlety concerning freedom of the Lord; It was an lifelong experience for me, the benefit of the souls as a confessor. I admired that He warns all of us in time, like me, before I went on… I believe that this is the way He acts for every soul. I think that it is not possible for anyone to use the excuse “I did not know” when the Day of Judgment is at hand. So, I have never met that girl again! I was so sure that it was the Lord who was talking to me, so that I always obeyed without any doubt or hesitation. I have never felt sorry for the path I chose; I always feel happy fulfilling Hiss Will, provided that I know that it is Him talking to me. (2) A note by the Author "I cannot tell how long it lasted, like the Confession I described before, during Mass." I was still in the Navy, when on a Sunday I attended Holy Mass. I served as an Altar boy, because I wanted to be next to the Altar and look at the Holy Gifts. The Lord told me a lot more things which unfortunately I do not remember now. However, when Holy Mass finished, I had no doubt for becoming a priest, and I was capable of making the best homily referring to Priesthood and its greatness! Of course, today I know much mre about the Priesthood, but at that certain period of time, I knew only what the Lord had told me. I had not known anything before, nor had I read anything relative to it. So, both Weeks were celebrated with great success and much attendance. Everything was properly organized; as in similar Weeks that take place in other countries (as I learned afterwards). It was as if I knew how these Weeks were organized, although I was not aware of the way they are organized and I had never attended one. My achievement was that each Bishop and priest of my Diocese came to my parish, and celebrated Mass for a universal purpose. Those purposes were related to the Church and the whole World intending to Salvation. Indeed, for the Eucharistic Week, Pope Paul VI sent his Apostolic Blessing. I have to remind to my readers of the fact that the work of the Lord is not done without fatigue and sacrifice. Prior to asking the Archbishop’s permission for these Weeks I had been fasting and prayed intensely for a month (!) and I asked others too, to pray for this purpose. When I went to ask for permission and saw the expression of his face… I still remember how hardly he said “yes” while I was praying mentally to the Mother of God! I thanked Her promptly for Her Intervention! I thanked the Lord for choosing me to perform this kind of action. I wondered how long the Body of Christ must have remained there, whilst many priests had been saying Mass on this Altar. Someone may have opened the ciborium quickly and carelessly, so the Host may have been lifted by the air and fell on the floor. One time, I was celebrating the Holy Mass in the Church of Our Lady of the Victory, known as “Santa Maria”, in Rhodes. After Transubstantiation, when the Body and Blood of Christ are commixed into the Chalice, spots of Blood appeared on the left side of the consecrated Host, whilst I was holding It into my hand. The phenomenon lasted some seconds, then those spots of Blood disappeared. The people who attended Mass saw that phenomenon too. “I can't stand it any more!" "It's cold, it's frozen. There's nothing in it!" I am recounting all this, as well as everything you are going to read on the following pages, because I believe that God wanted those phenomena to happen, so that my priestly life might be enriched as a confessor of lay and consecrated people, for the benefit of their souls. During the repairs carried out on the chapel of the Sisters, I was living temporarily in an apartment, because the presbytery was under reconstruction. The apartment included an empty room, where I could reserve the Holy Eucharist. But I had not got a Tabernacle to keep the Body of Christ safely, as recommended by the Church. I was afraid of burglars and sacrilege, and I used to say, when I was going out or to bed: "My Angels, protect my Lord and me!" "My Angels,, protect my Lord and me.” Suddenly, I understood! The Angel was standing at the middle point of of the distance between the Most Holy Sacrament and my bed! I admired how obedient these heavenly creatures are! So, what can I say? With so much weakness? So many sins? So many “thorns” with which I have wounded the Lord? Perhaps, all these “thorns” make me humble, so as to behave with goodness, compassion and understanding, similar to Our Lord’s ones, each time a person comes to me in order to receive the great Sacrament of Repentance. We all have to imitate to Jesus, up to the low degree that we can achieve. “Lord Jesus Christ, have mercy on me, the sinner!” Amen. Nicholas J. Vidalis was the last child of a large family and was born in Tinos Island (Cyclades) on October 30th, in 1930. His stay in Tinos was very short. He grew up in Athens where he graduated from the “Lycée Léonin” of the “Frères Maristes”. 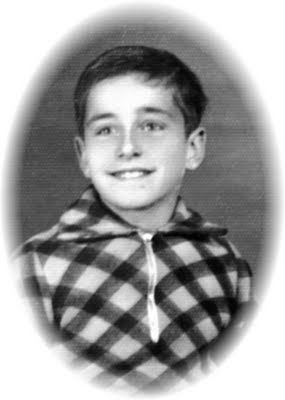 His graduation as well as his joining in the Army was delayed due to the World War II and the Greek Civil War. He joined the Greek Royal Navy on April 10th, in 1953 as a specialist in sonar localization. He served in for 27 months and on July 25th, in 1955 was released, receiving the “Blue Ribbon Certificate of Discharge” with excellent behavior and ability. 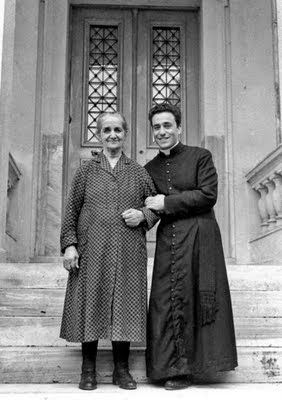 In October in 1955, Archbishop of Athens told him to study at the Church University Propaganda Fide, in Rome where he obtained a Baccalaureate in Philosophy, within two years. In addition, he studied Theology for four years in a supplement of the same university in Genoa of Italy being taught by excellent professors of the time. That Archbishop wanted him to study Law in the University of Genoa, but he was killed in an accident and his successor did not allow Fr Nicholas even to sit for an exam, because of “pastoral need”. When he returned to Greece was appointed as a parson in St Lukas parish, in Heraklion of Attica. There, with the help of God and Our Lady worked irreproachably in all fields, spiritual and material. He organized with great success for the first time in Greece, one Eucharistic Week and one Week dedicated to Our Lady. Moreover, he undertook the task of restoration and extension of the St Lukas church, restored the St Therese chapel in Heraklion, the chapel of the cemetery and the ossuary. Furthermore, he was the supervisor of the construction of the yards and surrounding grounds of the churches along with numerous other tasks. After ten years the Archbishop transferred him to the Cathedral. 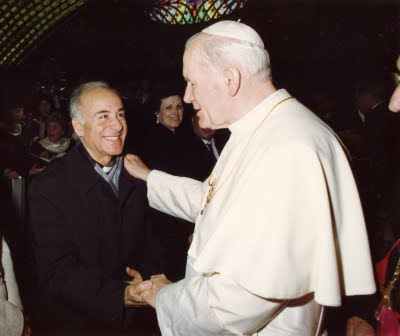 When the Archbishop resigned, Pope John-Paul II pronounced him as temporary (Ad Interim) Apostolic Administrator of the Archdiocese of Athens. So, in proper time, he handed the Archdiocese to the Archbishop who remains the current Archbishop today. Because he suffers from a heart condition, he was operated on and is now retired. Nevertheless, he offers many spiritual services to the School of Sisters of St Joseph in Pefki of Attica and to the Monastic Communities, until today. In addition, he hopes to publish his scripts which he has elaborated during his religious life. Msgr. Nicholas Vidalis passed onto his eternal reward on November 23, 2011. Fr. Vidalis, pray for us! Your site is such a blessing. I learn something new every day thru this site about His grace. 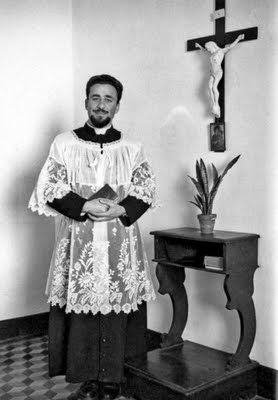 This Priest is a holy example to us, through him the Lord is showing us that He is really present in the eucharist.